We and others have previously shown that the development of rheumatoid arthritis (RA) is preceded by IgG anti-citrullinated protein antibody (ACPA) and rheumatoid factor (RF) [1, 2]. Furthermore, it was shown that other isotypes of ACPA (IgA and, to a lesser extent, the IgM isotype) also predate the onset of RA . Moreover, smoking has been linked to the development of IgA ACPA in the preclinical phase . We have extended these observations by using a previously described RA cohort in which serial preclinical serum samples were available . Three sequential serum samples from 30 IgG ACPA-positive RA patients who had donated blood before disease onset were selected and were tested for IgM, IgA, and IgG isotypes of ACPA (using the anti-cyclic citrullinated peptide 2 test) and RF, as described previously, by using the ImmunoCap system (Phadia, Uppsala, Sweden) . Smoking status (current or past smoker versus never smoked) was obtained retrospectively by chart review for 24 patients. For IgA ACPA, 57% of the initial samples (median of 5.7 years pre-diagnosis) were positive, increasing to 77% in the last available sample, at a median of 0.6 years pre-diagnosis. All but one patient was positive for IgG ACPA at all time points. For IgM ACPA, 20% of patients were initially positive, increasing to 43% in the last pre-diagnosis sample (Table 1). The median ACPA levels rose significantly (Figure 1). ACPA, anti- citrullinated protein antibody; IQR, interquartile range;RF, rheumatoid factor. 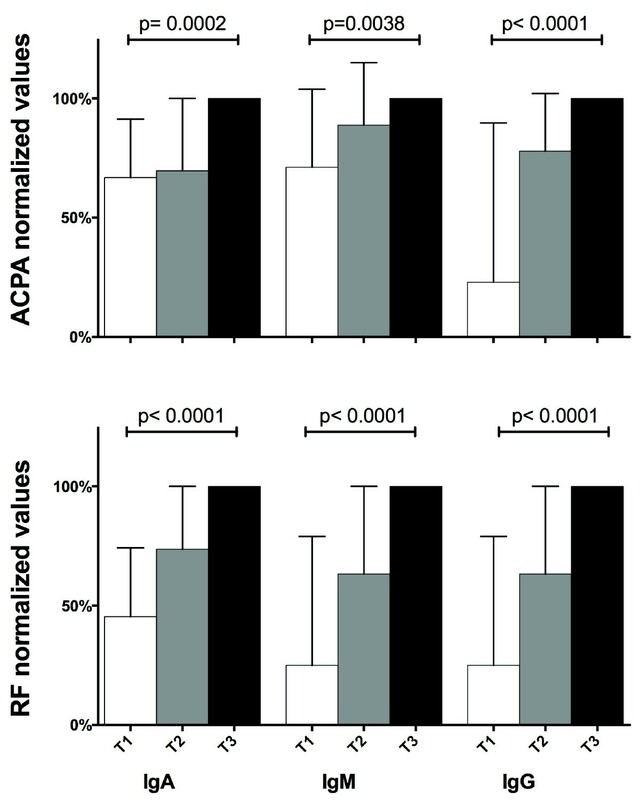 Anti-citrullinated protein antibody (ACPA) and rheumatoid factor (RF) levels rise prior to onset of rheumatoid arthritis. For better comparison, antibody levels were normalized to the percentage of the last available sample. The median ACPA levels rose significantly from 11 to 23, 32 to 48, and 24 to 358 AU/mL for IgA, IgM, and IgG, respectively (P <0.001 for all values, Wilcoxon signed-rank test). The median RF levels rose significantly from 15 to 52 IU/mL, 5 to 43 IU/mL, and 10 to 30 μg/mL for IgA, IgM, and IgG, respectively (P <0.001 for all values, Wilcoxon signed-rank test). ACPA, anti-citrullinated protein antibody; T1, first available sample; T2, second available sample; T3, last available sample. For RF, 67%, 13%, and 47% of the initial samples were positive for IgA, IgG, and IgM, respectively. These percentages increased in time to 87%, 37%, and 83% of patients, respectively (Table 1). The median RF levels rose significantly (Figure 1). Smoking tended to be associated with higher IgA ACPA and IgA RF levels, especially in the last pre-diagnosis sample, with median levels of 61 versus 13 AU/mL and 87 versus 11 IU/mL in smokers versus non-smokers, respectively (P = 0.2 and 0.06, Mann–Whitney U test). In the preclinical phase of RA, IgG ACPA comes first, followed by IgA, and then by IgM. For RF, the IgG subtype seems to appear after IgA and IgM. As postulated previously , the IgG-dominated anti-CCP pattern might reflect a mature T cell-dependent immune reaction, whereas the IgM-dominated RF response might represent a non-isotype switched T cell-independent immune response. All investigated autoantibodies rise over time before RA diagnosis. Finally, smoking seems to influence both IgA APCA and IgA RF levels and this is in line with the hypothesis that smoking induces or augments a mucosa-related immune response in lungs. The study was approved by the local institutional review board (METC Slotervaart en Reade), and written informed consent was obtained from all participants. AS performed the RF and cyclic citrullinated peptide assays. WHB performed the analysis of the data. All authors were involved in the conception, design, and interpretation of data and in drafting the article and revising it critically for important intellectual content and read and approved the final manuscript.